Hello everyone, CEO Olivia here. I was asked by H. Murphy, “why do you good dogs eat grass?” I actually don’t eat grass much but my furSister Suzie Q is an expert. Some humans think we eat grass because we have an upset stomach. Sometimes that’s why, but usually not. It is also believed that a bad diet will cause grass eating, but studies have shown that generally, this isn’t why either. Boredom, nutritional deficiencies or pica (eating things that aren’t food) are all considered as possible reasons for grass eating, but there is no consensus. 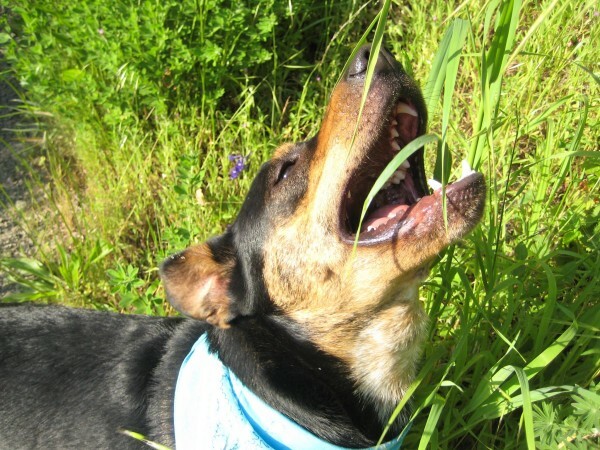 It may be that some dogs simply like to eat grass. In Suzie’s case, she had a hard life before she joined our family. She might have began eating grass simply because she was hungry all the time & acquired a taste for it. Although most experts agree that grazing itself isn’t harmful, one thing to keep in mind is that certain herbicides & pesticides used on lawns can be toxic to dogs. Additionally, a number of common house & garden plants are toxic, which could lead to problems if your good dog ingests them. The ASPCA’s Animal Poison Control Center maintains a list of toxic & non-toxic plants that you can research. After speaking with Suzie Q, I’ve concluded that good dogs eat grass because we like it. Unless there is an underlying issue such as Pica, it may be that simple. Now you Know. Oh I remember my old nibbling habits. BOL!